All shock mounts fail at some point in time. We use the same style shock mounts as Herman Miller. We have chosen the strongest adhesive available, one that is specifically designed for this purpose. One of the unique services we provide is the near seamless repair of broken wings. The difference between restoring and refinishing is a matter of taste. Some people like their Eames lounges to show a little age (restoring) other people prefer a more pristine look (refinishing). In both cases, we are not aiming to make the chair look new but to create a patina that accurately reflects what the chair would look like if it were kept in near perfect condition. We can make you new leather cushions. We have invested years mastering the process to make sure we reproduce all the details of the original cushions. We have chosen a leather that best reflects the quality and sheen of the original Eames lounge leather. If your leather is chaffed or merely worn (no major tears or rot) then we can restore them to near perfect condition. We replace worn out old zippers and we can repair and or replace the fiber board backers. 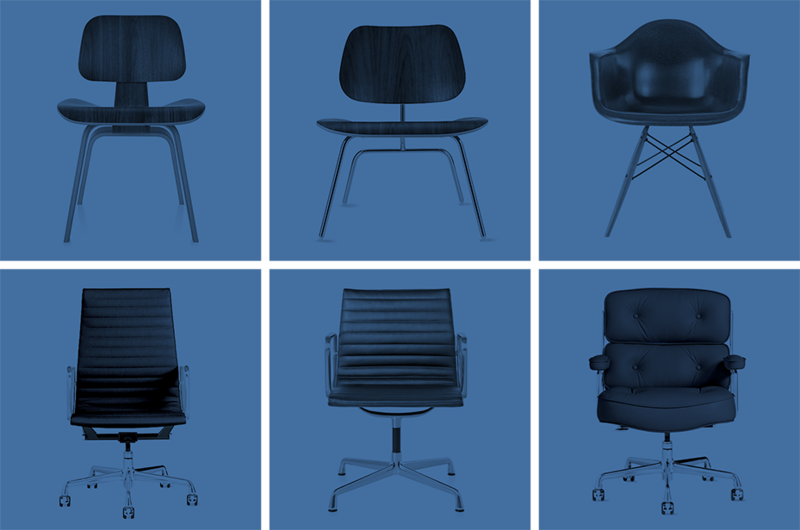 We repair shock mounts, restore and refinish the wood shells, and restore the fibergalss shells on all other Eames chairs. We also restore wood, replace shock mounts, and reupholster leather on all other Eames chairs.